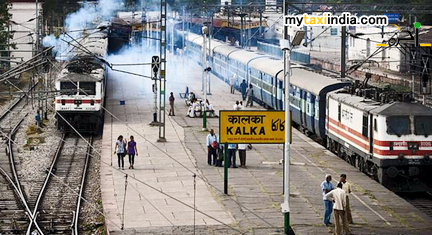 Kalka railway station is the northern terminus for Delhi-Kalka line. It serves as the starting point of Kalka-Shimla Railway, the UNESCO World Heritage Site. Situated in the Indian state of Haryana, the station serves Kalka and passengers moving towards Shimla. Kalka railway station is managed under the jurisdiction of Ambala railway division. Initially, the Delhi-Ambala-Kalka line was opened in the year 1891. The electrification of Chandigarh-Kalka sector was accomplished in 1999-2000. The station comprises of two double-bedded non-AC retiring rooms. It also houses a four-bedded dormitory. Kalka railway station has a computerized reservation office, refreshment rooms serving both vegetarian and non-vegetarian food, and a book stall. Kalka is a small yet beautiful city and a municipal committee in Panchkula district, Haryana state, India. Situated on the foothills of Himalayas, the town has an entry point to Himachal Pradesh - The land of Gods. The name of the town has been derived from the Goddess Kali as well as an ancient temple of the Goddess located here. The Kali Mata Temple is one of the major tourist attractions here. It is dedicated to the Hindu Goddess Kali. The temple is an ancient temple visited by many devotees during the festival of Navratri. Hiring a taxi in Kalka will help you enjoy the tour in Haryana and areas around better. At My Taxi India, we will take special care of your Kalka visit. Regardless how tall your tour expectations are, we’ll fulfil them and gift you an unforgettable travel experience. The services offered in Kalka ensure highly efficient and relaxing tour experience. Our unprecedented car hire and Railway Transfer service are popular among esteemed patrons. They keep visiting us for their requirements time and again. If you are looking forward to visit Kalka in Haryana, give us a chance to help you with the best facilities. We promise the best prices in the industry. Here, we will provide you with updated info and latest technology and the best car hire service. Book a taxi with MY Taxi India and experience the difference.